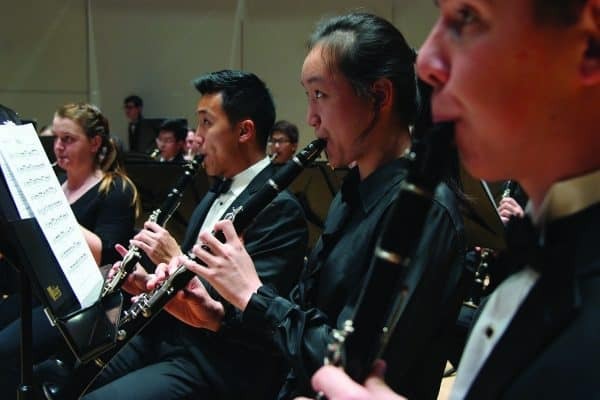 Join the University Wind Ensemble, conducted by Christopher Dobbins, for its fall concert, “Shipping Out.” The concert will take place on Nov. 6 at 8 p.m. in Wilson Concert Hall in the Lenfest Center for the Arts. The concert is free and tickets are not required. The program will feature the art of musical story-telling and will focus on a young soldier readying for deployment — musically depicting the highs and lows leading up to a soldier’s shipping out. The concert will include music by American composers Jim Stephenson, Stephen Bryant, Travis Cross and Eliot Del Borgo. Also highlighted will be the winning pieces from the first annual W&L Wind Ensemble Composition Contest: “Muse” by Joshua Hobbs and “New York From a Distance” by Daniel Dade. The program will also include Gustav Holst’s iconic “First Suite in Eb for Military Band,” which some historians describe as a musical depiction of a solider readying to join the front lines of World War I. The concert will be streamed live online at https://livestream.com/wlu/shipping-out.